*This paper was initially submitted and accepted for presentation at the World Conference of Humanitarian Studies in February 2009 in Groningen (The Netherlands). The phenomenon of refugees and displaced persons has been a part and parcel of humankind’s history from time immemorial. Conflicts, natural or man-made disasters as well as persecutions of political, socio-cultural and religious order have been the major causes of human movements within and across boundaries. Since the end of the cold war and the new world order with monopoly replacing bipolarity, the number of refugees and displaced persons have increased at exponential rate due primarily to the changes in the security trend. The African continent has witnessed more of intrastate violence in the post Cold war period than the classical interstate conflicts and the civilian faction has been the most affected group during such events. The trend is continuously validated each time there is an outbreak of violence, with scores of vulnerable persons moving towards politically calm and peaceful countries to seek refuge. The central Africa region commonly described as a “hotbed” of fratricidal tensions, has been the breeding ground of the most uncontrollable refugee catastrophes in the continent more than any other region. Failed states, dictatorship, mismanagement and unequal distribution of funds, social injustice, intense desire for democratic succession and power sharing, the small arms and lights weapons proliferation across porous borders inter alia; are some of the reasons behind the persistence of “new conflicts” in the region. Cameroon, a state within the region, has enjoyed “relative” peace during the most part of its post independence period, thereby making it a major pole of attraction for refugees and displaced persons circulating in the region. These movements towards Cameroon’s periphery and mainland have provoked unhappy feelings both from the government of Cameroon and the local host communities. The socio economic and political problems that have accompanied refugee outflows and displacements though not unique to Cameroon alone as a host country, begs for an evaluation or re-evaluation of the pros and cons of refugee movements and settlement in general. Against this backdrop, the paper will endeavor to provide some answers related to the challenges of displacement to refugees and the host government and communities. The paper will single out the socio-economic difficulties faced by refugees in integrating the Cameroon society. It will ricochet and laude the multi-dimensional contributions made by refugees both skilled and unskilled to the Cameroon economy; and advocates for greater attention, resources allocation and the socio-economic and political integration of refugees in the Cameroon societies. The rationale behind this paper is that, refugees and displaced persons are not just a burden or source of insecurity and instability as popular opinion holds. The paper holds that, if refugees are well managed, they could bring plausible socio-economic and political contribution to their host country. Within this research, principal concepts used include the followings: Crises (Humanitarian) and Refugee. The term crisis has been defined as an event or series of events which represent a critical threat to the health, safety or wellbeing of a community or other large group of people, usually over a wide area.1 This paper defines it as a situation of social anarchy and suffering marked by depreciation in the standard of living to the point of threatening human life and wellbeing in a given environment. The common determinant of a humanitarian crisis in the context of this paper would be the presence of refugees and displaced persons. All persons under such conditions have the full rights to seek refuge in any other politically stable country while waiting for situations in their home countries to get better. There is therefore a major difference between a refugee and a migrant. Normal migrants move across boundaries “voluntary” in search of better economic standard; meanwhile refugees are forced to move because of threat to their life. The republic of Cameroon is situated in the central Africa region.4 Cameroon is commonly known as Africa in miniature because of her cultural and geographical diversity.The political history of Cameroon like many others African countries was marked by bloody struggles for independence. This was one of the toughest and most fierce moments of her history. The Union des populations du Cameroun (UPC) a political party led by its charismatic leader Ruben Um Nyobe waged a hostile resistance to French colonialism and advocated immediate independence for Cameroon. The party expressed its disgruntlement through a series of violent riots and killings which became known as the “Maquis”. Thousands of Cameroonians lost their lives during the period of the UPC “Maquis” which began in the early 1950s and dragged on until January 1971 after the arrest and execution of UPC’s last surviving leader Ernest Ouandie. In 1960, political talks of self determination led to the independence of the French Cameroons; meanwhile the Southern Cameroons (British part of Cameroon) remained under British Trusteeship until 1961 when it voted to join the French Cameroon in a federation, forming the Federal Republic of Cameroon. Cameroon only became the Republic of Cameroon in 1984 following constitutional changes .5 The violence that marked Cameroon‘s independence helped to shape the political attitudes of many Cameroonians. The craving for post-independence stability was a gradual construct which materialized overtime. Despite the few diplomatic differences which Cameroon had with some of its neighbors like Nigeria over the Bakassi peninsular or with Equatorial Guinea over the island at the mouth of the Ntem river; Cameroon still managed to remained politically and socially stable. The perceptible peace that prevails in Cameroon has been a pull factor for many African refugees fleeing wars and violence in their countries. The peace commodity has made Cameroon to rank as number one place of refuge for many refugees and displaced persons from the wider central African ECCAS region 6. Although this may sound flattening on the one hand, the massive influx of refugees has become an issue of concern for the local host population in particular and the Cameroon government in general. Intrastate conflicts in Africa have caused massive and uncountable numbers of refugees and displaced persons in the central Africa region. Cameroon, an adherent to both international (Geneva 1951 and 1967) and continental (OAU) conventions and protocols on refugees has been a hospitable host to thousands of refugees and displaced persons from across the continent. Cameron has hosted approximately 60,000 refugees from different countries such as the Democratic Republic of Congo (DRC), Rwanda, Burundi, Central Africa Republic, Equatorial Guinea, Ivory Coast, Sudan, Liberia and Nigeria. Chadian refugees are the highest refugee group whose number rose from circa 200,000 during the violence of May 1980 to circa 40,000 persons in 1990(Nkonlack,2003:15).7 According to statistics from the CIA World Fact book of 2007, there were between 20 to 30,000 Chadian refugees living on the Cameroon soil. 8 Even though a few thousands of Chadian refugees had returned home when the conflict subsided, recent clashes between the rebels and government troops of Idriss Deby in February 2008 saw a record high influx of more than 58,000 refugees fleeing from N’djamena into neighboring Kousseri, 9 with over 30,000 living without shelter. Today the majority of the Chadian refugees have been moved from Kousseri and resettled in areas like Maltam and Mandana (all towns in north Cameroon). According to a UNHCR press release on 14 February 2008, there were only about 5,000 refugees left in Kousseri region. 10 Jacques Franquin, the Representative of UNHCR in Cameroon revealed that Nigerians who fled ethnic clashes since 2001 and settled in the Adamawa and north west11 regions of Cameroon numbered close to 17,000. Many however left in April 2005 following the joint Cameroon /Nigeria /UNHCR voluntary repatriation of 10,000 Nigerians.12 By 2007, there were only about 3,000 Nigerian refugees left after the repatriation efforts were complete. Refugees from the Central African Republic (CAR), mainly nomads (“mbororos”) who had fled from their country since 2005 were approximately 26,000 in number.13 However, their number reduced drastically with the return of peace in CAR. The majority of those who chose to remain settled predominantly around Kenzou, Bertoua, Garoua Boulai and Batouri. A 2005 statistics of refugees living in the urban areas of Cameroon showed that close to 10,000 refugees lived in the capital city Yaoundé and 5, 000 lived in the economic capital Douala (Tadjon, 2003).14 Today, the number of refugees living in the urban areashas risen to a record 15, 318; due to the search for job opportunities and the desire to reunite with extended families living in the big cities. 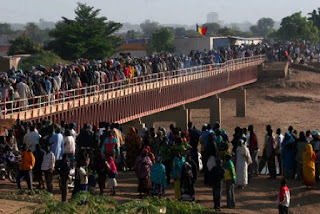 According to a December 2008 statistics obtained from the UNHCR Cameroon office, there was in total 82, 776 refugees and 2, 759 asylum seekers in Cameroon; with 62,919 settled in the Eastern and Adamawa regions, along the CAR border. 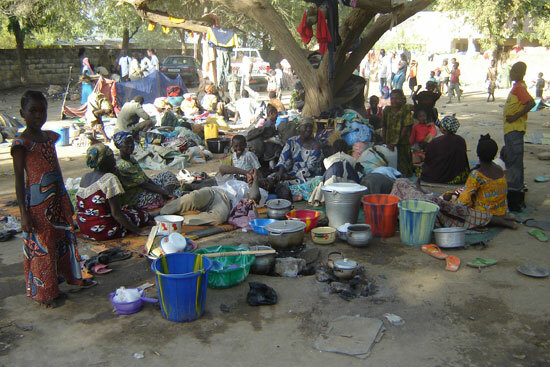 In addition, while 2,871 Nigerian refugees settled in the Banyo area (Adamawa region); 4,236 new Chadian refugees fled into the Northern region of Cameroon15 after the violence of February 2008 in Chad. There is from the statistics of persons of concern to UNHCR in urban areas in Cameroon on table I below, it can be deduced that the majority of refugees have hailed from the Central African region with Chad Republic toping the charts. This is explained mainly by the persistent domestic violence that has trapped the region since the end of the Cold war. The recurrence of violence in Chad, DR Congo and the Central African Republic (CAR) particularly hold this analysis true. The high influx towards Cameroon has been almost spontaneous and natural because of the peace and stability in Cameroon and also because she is a neighboring state. Analytically, the increase in the numbers from 60 000 refugees in the 1980s and 90s to 82, 776 in 2008 reveals the presence of a serious and growing domestic insecurity problem in the Central African region.